I still find it ironic that today I spend the vast majority of my time addressing the marketing side of a growth business’ agenda. When I started Imagine 11 years ago, the plan was to create a sales advisory and training company that would change the way salespeople sell. Our team prided ourselves on our sales acumen, yet as we spent more time addressing the sales issue, we realized that for the small and mid-market, at least, we were fighting a fool’s errand. We realized that you couldn’t solve the sales problem without first addressing how these companies were going to market and how they handled lead generation and management. Over the last five years, as I’ve moved from a sales-predominant focus to a far more balanced perspective, I’ve learned a few things. Chief among those is how people from the sales side and the marketing side of a business both want the same thing, and yet they drive each other insane in the process. 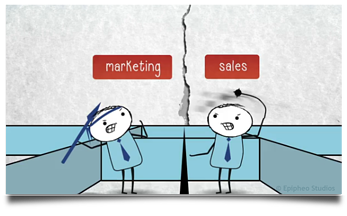 Today, I share the first half of my series, focusing on how marketers frustrate salespeople. Later this week, I’ll share 5 Sure-Fire Ways The Sales Dept. Frustrates Marketing. The biggest cause for this is that marketing often moves leads to sales too early. It’s important to note that just because someone downloaded a white paper from your website or clicked a link in your email newsletter doesn’t mean they’re ready to engage in a sales conversation. Solution: Develop a clear process and agreement into the cultivation of a lead and how and when a lead should be turned over to sales. One of the unique characteristics of a salesperson is that they always live with a number. Every month or even every day a salesperson is responsible for achieving specific results. While effort and activity matter, salespeople need to achieve results. Salespeople get frustrated when marketers don’t live with the same responsibility. When a marketer talks about awareness, visits or even leads as the metric, they frustrate salespeople for two reasons. First, the metric being used is constantly changing; and second, the metric has no clear connection to revenue. Both marketing and sales are responsible for revenue generation. One cannot succeed without the other. Today, especially, marketing has more responsibility for revenue generation than ever before. Solution: Marketing needs to be assigned a quota that is directly connected to revenue generation. The measurements should be articulated in a clear sales/marketing service level agreement. Everybody loves a good pen, and don’t even get me started about the terrific padfolios that were just bought (sarcasm implied). Don’t get me wrong, there’s nothing wrong with ad specialties and a little bit of swag is good for everyone; but trinkets and trash are not going to generate sales. But please understand that the more “creative” you get, the more likely you’re going to frustrate your sales team. Very few B2B sales teams are stalling because of a lack of creativity or a powerful tag line. All the creativity is the icing – it’s not the cake. Solution: Marketing more than any other function should ensure that everything that is communicated is tied to clear buyer personas and aligns with a market message built for the customer. Content marketing frustrates salespeople. They’re not against content, per se; but, they’re frustrated that the vast majority of content that comes out is crap, irrelevant or both. Look, the days of providing product slicks and brochures are (almost) over. Okay, some industries still require them, but don’t confuse creating those materials to creating revenue. Solution: Marketers, you own the first sale. Your job is to teach the problem. Create content that provokes awareness of the issues and influences. Your goal should be to create at least one piece of content every month that salespeople will actively use early in the process to get to the right people, not just at the end. Marketers have an unique vantage point. They can, and should, see the entire playing field. Salespeople live in the trenches. Marketers should be able to provide useful insights into trends and issues taking place in the real world. This intelligence should enable salespeople to allocate their time better and increase the results of their efforts. Unfortunately, that rarely happens. Too often marketers talk about things that are irrelevant to salespeople and salespeople stop listening. Solution: Think of it this way, marketers own the problem and salespeople own the solution. Marketers should regularly be briefing salespeople on how problems are manifesting themselves, what’s happening in the competitive environment and what’s happening at the top of the funnel so that salespeople can stay aligned. There is nothing that will frustrate a sales team faster than when marketers have only a theoretical understanding of the sales process and what really happens in a sale. I love process as much as the next guy (and many people would say I love it more). But, I understand no successful sale happens the way it was drawn out in the playbook. Look, I’ve built a lot of playbooks and I think they’re valuable guides. When you think of them as written in stone, they become useless. Solution: Marketers, if you want to influence and align with salespeople, spend a day in their shoes. Listen in on their calls. Join them on client and prospect visits. Maybe even make a few calls of your own. When you demonstrate that you understand what happens on the ground, salespeople will gain a higher degree of respect for you, and a symbiotic relationship will emerge.